MUMBAI: India’s Jet Airways extended a suspension of all of its international flights until tomorrow, the latest blow to the debt-stricken carrier battling to stay afloat. The development Friday came after the government said it would investigate Jet’s ability to continue flying as lenders seek a buyer to keep the beleaguered airline running. 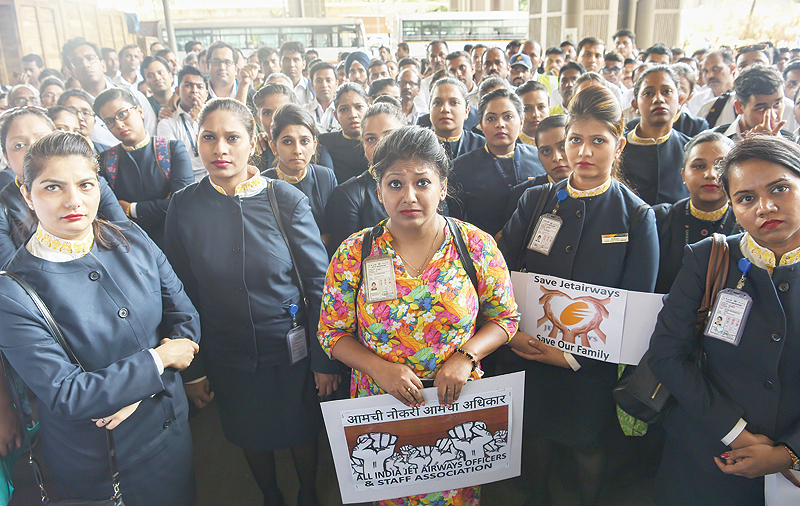 Passengers have been left stranded, and on Friday airline staff protested at Mumbai’s airport. A collapse would deal a blow to Prime Minister Narendra Modi’s pro-business reputation as Indians vote in a mega six-week-long election that started Thursday. A Jet Airways source told AFP that all of Jet’s international flights out of and into India until Monday had been scrapped, extending a series of cancellations announced on Thursday. Aviation minister Suresh Prabhu earlier tweeted on Friday that his ministry would “review issues related to Jet Airways” and “take necessary steps to minimize passenger inconvenience and ensure their safety”. Jet was until recently India’s second-biggest airline by market share but is close to going under with debts of more than $1 billion. The Mumbai-based carrier has been forced to ground the majority of its fleet after months of defaulting on loans and struggling to pay lessors and staff. The airline has a fleet of 119 aircraft but Civil Aviation Secretary Pradeep Singh Kharola said it would fly only six or seven of them over the weekend on domestic routes, after flying 11 on Friday, the Press Trust of India (PTI) reported. That is below the 20 required by Indian aviation regulators to fly overseas. Close of play Friday was the deadline for prospective bidders to express an interest in acquiring a 75-percent stake in Jet. A consortium of lenders led by the State Bank of India started the stake sale process on Monday. Any interested parties will then have until April 30 to make a formal bid. The consortium took control of Jet Airways last month after creditors injected $218 million of “immediate funding support” as part of a debt resolution plan. The deal saw founder Naresh Goyal step down as chairman. Etihad Airways, which owns a 24-percent stake in Jet, has submitted an expression of interest to buy a controlling stake of up to 75 percent, according to Indian business dailies. PTI, quoting sources, said Goyal has put in a bid for the airline, although it was not clear whether he had partnered with another entity or airline.